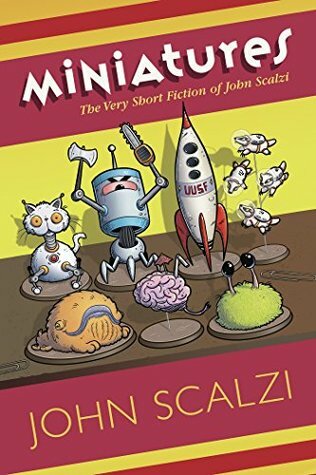 Minatures is a collection of very short stories – many of which are short enough to be flash fiction. All of them shorter than 2,300 words – all of them crazy science fiction stories. Most are reprint though there are a few new stories. I had however not read any of them before. I read most of this on public transport and I have to say people must have thought I was a bit crazy as I was smiling from ear to ear and giggling more or less the whole time. I only skipped two stories – the rest had me. The stories are short and almost all funny or at least silly. This is not the collection you pick up if you want something serious but it is the perfect pallet cleanser after a dark book or if you want something light up your day. I partially like the Star Trek and super hero pieces.